Daniel Arsham, Corner Knot. Exhibition view at Moco Museum in Amsterdam. Photo by Isabel Janssen. 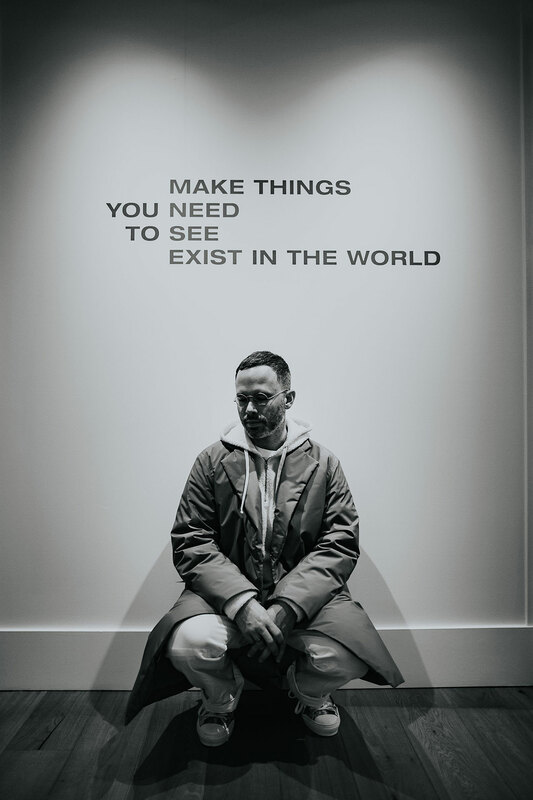 One of the inscriptions on the walls of Amsterdam’s Moco Museum’s retrospective exhibition of New York-based artist Daniel Arsham, “Connecting Time”, reads “Make things/ you need / to see / exist in the world”. It could be a rallying cry for artists the world over but more than anything it’s an apt encapsulation of the artist’s modus operandi. 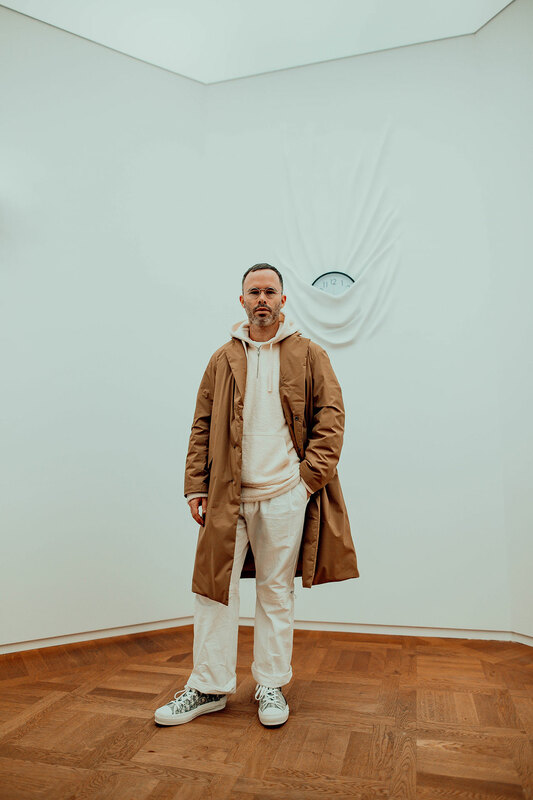 Encompassing several disciplines, from architecture and design, to fashion and sculpture, Arsham’s interdisciplinary work astounds viewers with its veiled ambiguity and subversive familiarity. The expansive exhibition at the Moco Museum, created in collaboration with Galerie Perrotin and Galerie Ron Mandos, and which will run until the end of September 2019, spans Arsham’s entire career immersing visitors into alternative realities and distorted dimensions where, true to the aforementioned motto, past, present and future co-exist at the artist’s will. 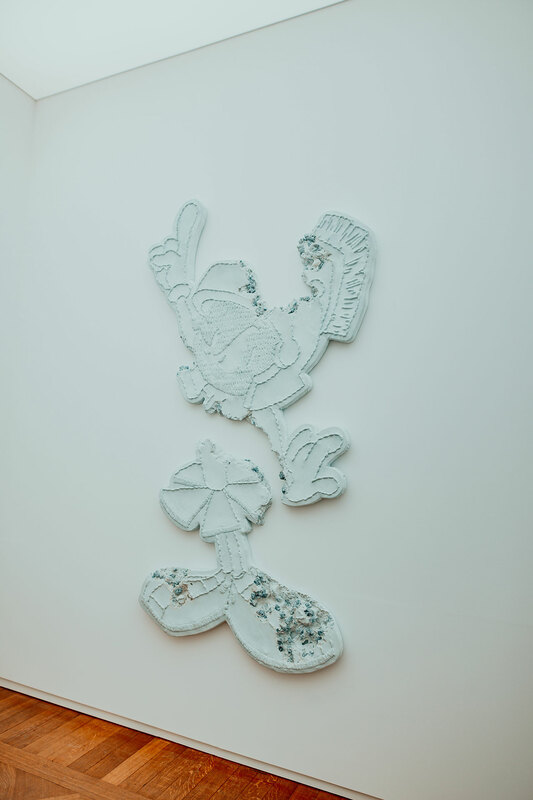 Daniel Arsham, Eroded Patches. Exhibition view at Moco Museum in Amsterdam. Photo by Isabel Janssen. 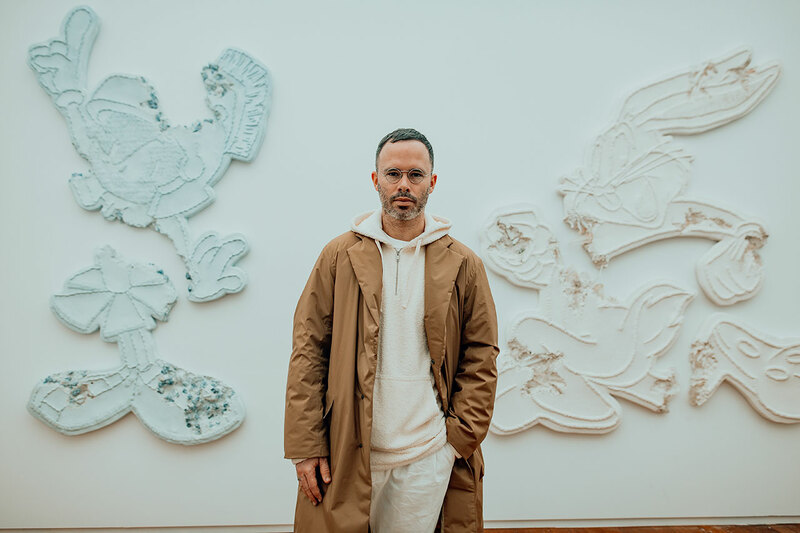 A central concept in Arsham’s work is 'fictional archaeology' whereby everyday objects of contemporary life and pop culture, from laptops and cereal boxes to teddy bears and Disney characters, are imagined by the artists “as if they’ve been uncovered on some future archaeological site”. Inspired by a visit to Easter Island, whose monuments are still a mystery to archeologists, Arsham uses geological substances such as volcanic ash, rose quartz, obsidian, and glacial rock, to create a series of artificial relics that he continuously expands. Faced with such intriguing artifacts such as the Miami Heat Jacket and Eroded Pluto Dog, visitors are encouraged to evaluate them in terms of both their present and future values, as well as consider their potential obsolescence which seems to be accelerated by technological advancements and rampant consumerism. 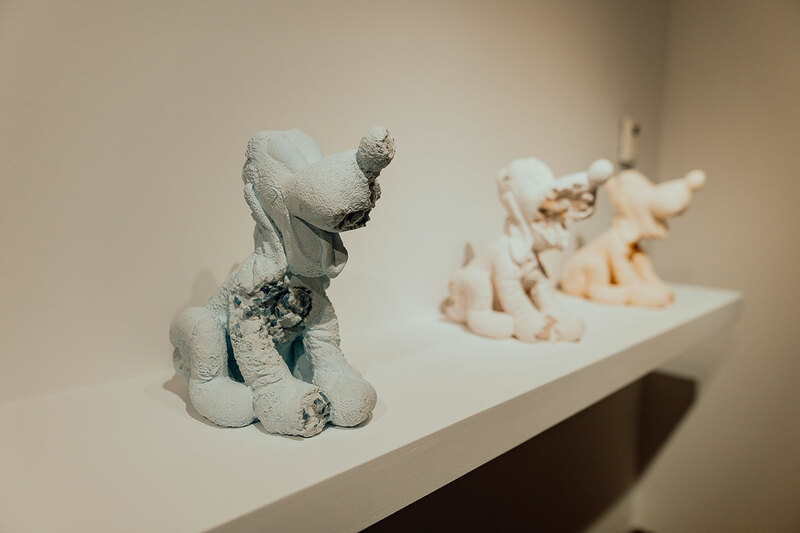 Daniel Arsham, Eroded Pluto Dog. Exhibition view at Moco Museum in Amsterdam. Photo by Isabel Janssen. 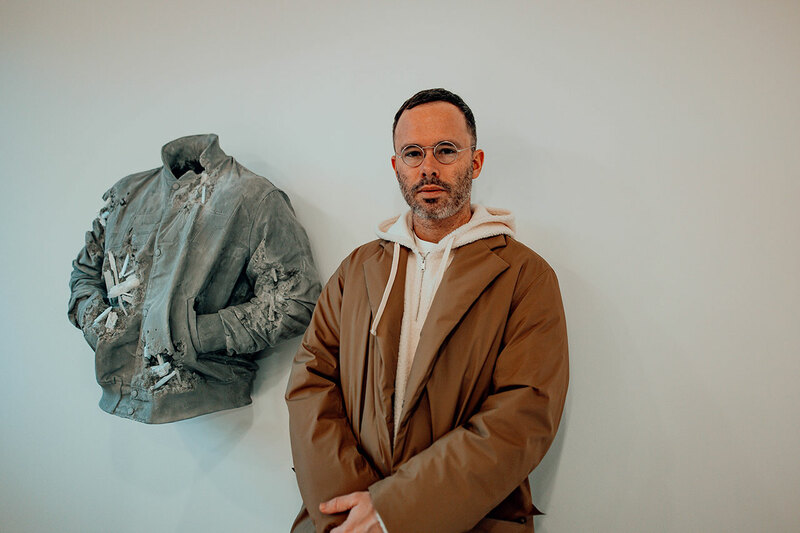 Daniel Arsham, Miami Heat Jacket. Exhibition view at Moco Museum in Amsterdam. Photo by Isabel Janssen. 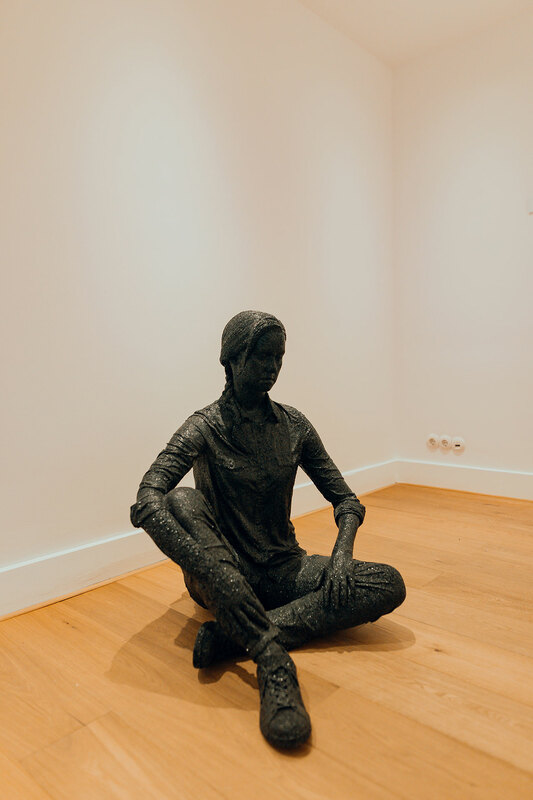 Daniel Arsham, Seated Female Figure​. Exhibition view at Moco Museum in Amsterdam. Photo by Isabel Janssen. 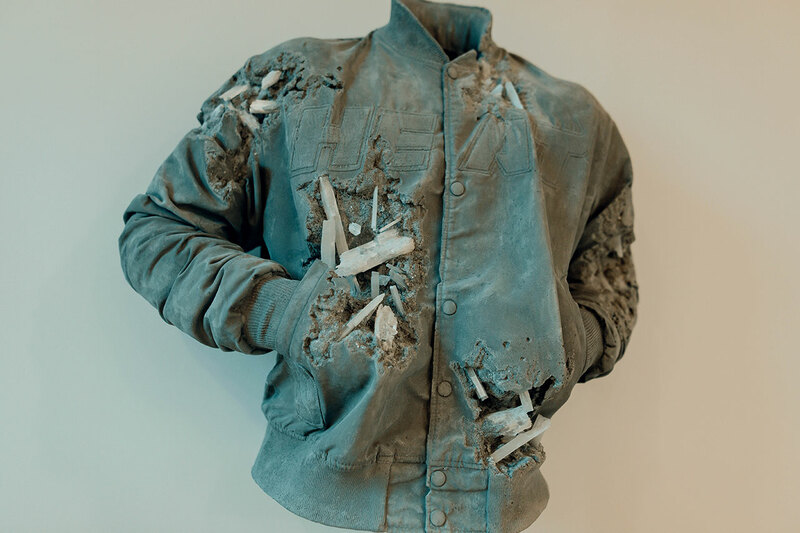 Using similar techniques, Arsham has corroded a white wall and “exposed” an underlying mineral core. Titled Eroded Wallpaper, the installation references the inherent vulnerability of architecture against the passage of time and the power of nature, a recurring theme that the artist has been exploring in his work after witnessing the destructive power of a hurricane in his childhood. It is also indicative of how closely intertwined his artistic practice is with the discipline of architecture. 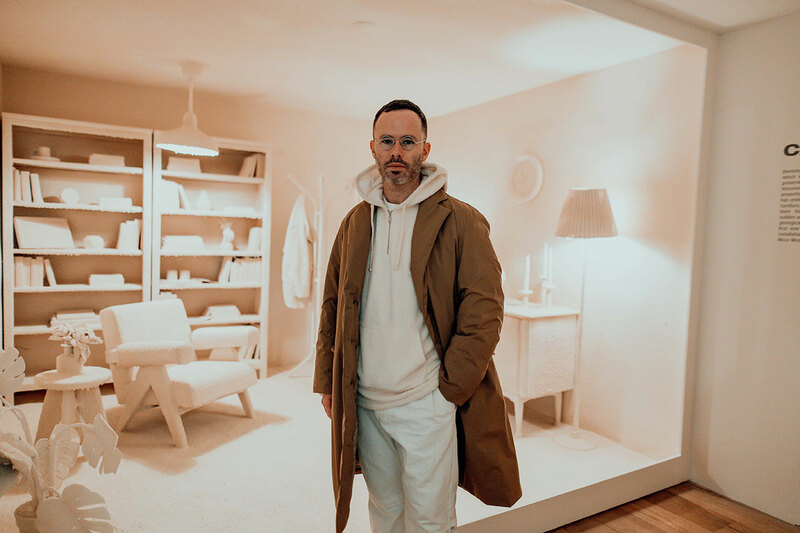 In fact, Arsham not only started out as a stage designer, but he also runs his own architectural firm Snarkitecture which has collaborated with renowned artists, musicians, designers and brands. Arsham’s architectural sensibility is also apparent in his Elastic Wall series that playfully test our perception of physical space. On display from the series is his iconic piece Hidden Figure, which as the title suggests uncannily features a figure trapped inside the wall inspired by the technique of draping used in ancient Greek sculptures, as well as other mind-bending pieces made out of fiberglass, like Corner Knot and Falling Clock that literally distort the architecture of the gallery rooms. Daniel Arsham, Falling Clock. Exhibition view at Moco Museum in Amsterdam. Photo by Isabel Janssen. 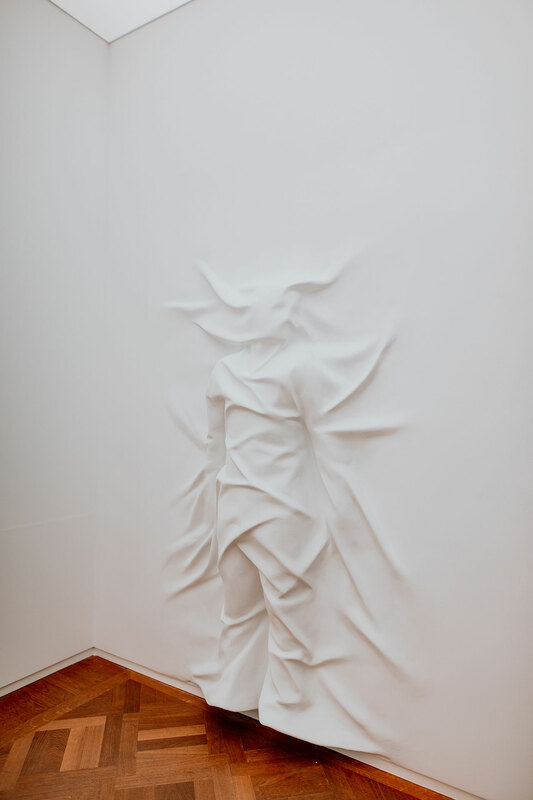 Daniel Arsham, Calcified Room. Exhibition view at Moco Museum in Amsterdam. Photo by Isabel Janssen. 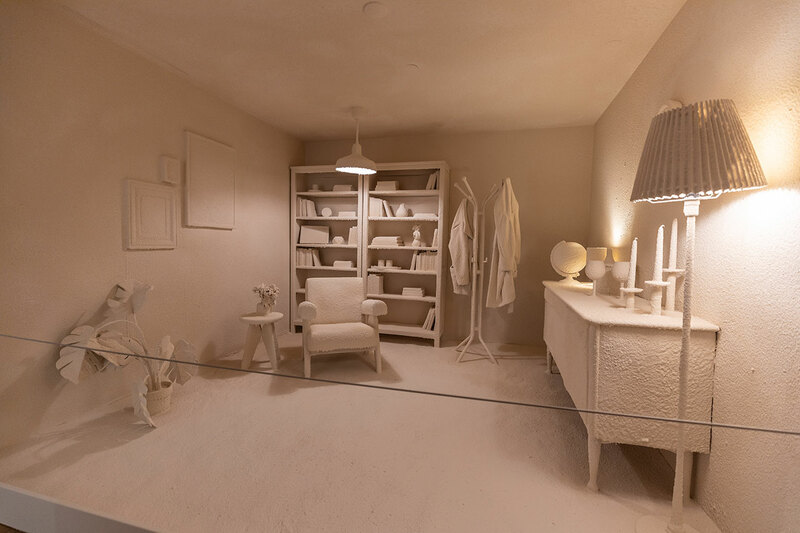 Calcified Room, an off-kilter installation that Arsham created especially for the exhibition, presents a post-apocalyptic scene where an ordinary home has been calcified. Every item in the ghostly living room, from the mid-century furniture and the light fittings to the potted plants, books and clothes, has been turned into a fossil, as if the space has undergone an extremely long process of decay, or perhaps has experienced a sudden, violent occurrence like the eruption of Mount Vesuvius whose ashes perfectly preserved the city of Pompei. As perplexing is Amethyst Ball Cavern, an installation that immerses visitors in an utterly confounding space that is nevertheless imbued with some familiarity. 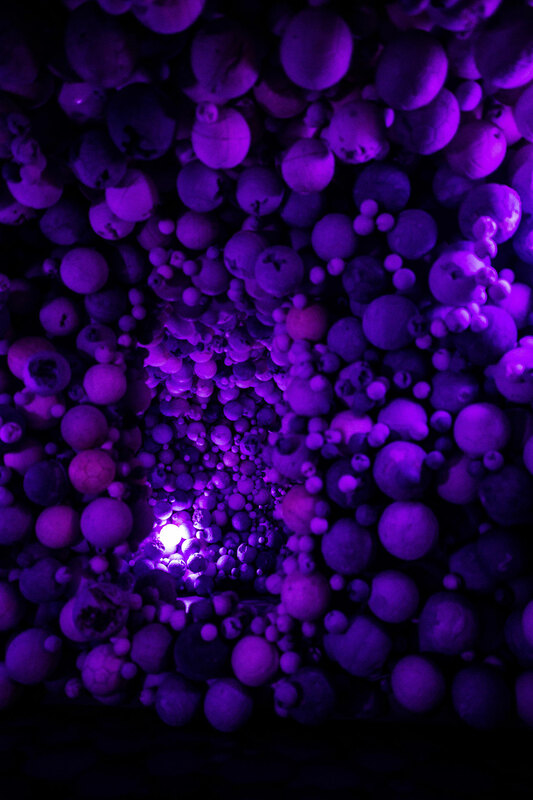 Hundreds of decayed, purple tennis and volley balls are densely piled to form an absurd, whimsical cavern. As visitors walk through this dream-like catacomb, softly lit by three illuminated basketballs coated in amethyst that Arsham calls ‘future relics’, their sense of time and place is confounded—this could be a dystopic future or a surreal nightmare. The sense of dislocation becomes all the more jarring when visitors catch glimpses of their own reflection, courtesy of a discrete mirror amid the purple phantasmagoria. Like the rest of the works in this immersive exhibition, Amethyst Ball Cavern evocatively encapsulates the underlying intent of Arsham’s work which in his own words aims to transport visitors “to a future from which they can look at the objects from their own experience, their own lives, with the perspective of time”. Daniel Arsham, Amethyst Ball Cavern. Exhibition view at Moco Museum in Amsterdam. Photo by Isabel Janssen.